It may seem odd that we’re advocating practising riding deliberately in a potentially risky manner, but in doing so the skills and reflexes you’ll be learning will prove a valuable asset when you find yourself in the bunch at a sportive or road race. Bunch riding boils down to being at ease riding in very close proximity to others, and in dealing with the occasional rubbing of shoulders and knuckles. If you’ve never experienced this before then it’s likely to feel unnerving, and that’s when problems can arise. 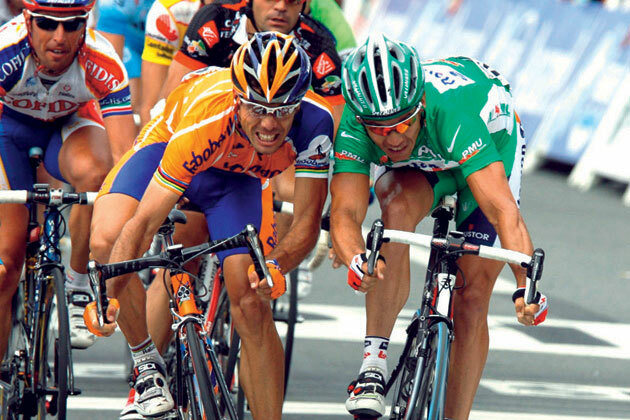 >>> Is this cycling’s best photo finish ever? You stiffen up in panic, start to wobble, or worse, reach straight for the brakes, causing danger to both yourself and all those around you. It’s a perfectly natural reaction, but one that with a little more familiarity with the situation, can easily be overcome. Factoring in some time on a training ride, to get up close and personal with your mates in a controlled environment, means you’ll soon realise the odd touch of bodies or bars on the move needn’t spell disaster. We’re not talking leaning on each other at 45 degrees here, but just getting outside your comfort zone in terms of your proximity to others and the occasional contact. As with any skill, the more you practise, the more competent you become, and quickly it will no longer faze you, so you’ll be much more confident when the situation arises for real. Firstly, you must find a willing volunteer to practise this skill with you. You’ll be best off if this person is of similar size and body weight to you, in the interests of fair play. The key to practising this safely is finding the right place and time to do it. Leaning on your colleague in the middle of the rush-hour commute in a bid to forge ahead in the race to the office is probably unwise. Find yourself plenty of space, away from traffic and other road hazards such as kerbs and traffic islands, and even consider using a playing field in the early part of your practice if you’re worried about coming a cropper. Start at a relatively slow speed, but not so slow that you’re wobbling before you even start trying to ride close to your partner. Level one With your hands on the hoods, ride for a set distance, staying as close as possible to one another without actually touching. Level two Try to ride the same set distance but this time stay in contact with each other, perhaps brushing elbows or knuckles, the whole way. Level three Try to ride the same distance again, but this time actually leaning on your partner, and trying to push them off line, while at the same time resisting them leaning back on you to hold your own line. Advanced level Add a third rider, so that the rider in the middle becomes the meat in the sandwich, and is being squashed from both sides simultaneously. If you can get the hang of all this then it will be second nature come your next event. If things get a bit close and hairy stay relaxed, look ahead and keep pedalling smoothly. Drop your shoulders and soften your elbows to absorb any bumps.